It's My Fall Mantel, Darnit! blogland don't always translate to the real world. Here's the thing...a month ago I redid the mantel. I covered a piece of cardboard with pages torn from a hymnal to make the artwork. You've seen that lots of times, right? Then I hung the wreath on top. Because a wreath makes everything prettier. Right off the bat my husband said it looks like Christmas. This was at least a month ago so he took the wind right out of my sails! I tell them it's pages from a hymnal and they say .... oh, that's nice. The kind of nice that let's you know they aren't so sure about it. Or maybe they think you are a little cuckoo. I think it's really pretty and not so Christmas like. There's no red ribbon or Santa peeking out. wreath and I want to enjoy it. And mercury glass is for all year, in my opinion. So this has been our fall mantel for the last month or more. Do you change the mantel for every season? The wreath is gorgeous and one thing I notice that I really like! The picture frame is large and the wreath is nicely proportionate! I think you did great. AND...I don't have a mantle! heehee! HUGS! I love your boxwood wreath! I get a lot of stares and questions when people come to visit too. I always tell them to check Pinterest, but they don't know what that is either!! Your mantle looks beautiful and if I had one I probably would change it with the seasons. I think that it looks great! I do change my mantle out for the seasons. I have to say, I don't really change my mantel for the seasons, but of course, I feel the need to try it now that everyone in blogland does it! I don't think yours looks Christmassy at all - it's lovely! The pages of the hymnal make a beautiful backdrop for it. Don't listen to anyone else! It's great! Stacey I LOVE everything about it!! Well if you like it that's all that matters. I too have a preserved boxwood, but I only get it out at Christmastime - but that's just me. Love it, keep it, enjoy it - be one with your decisions. Looks awesome. I always change it with the seasons, I love your mantle and I think it looks great! I love your newly dressed mantel! So pretty for any time of the year in my opinion and I LOVE the hymnal pages too. I do redecorate my mantel for fall and Christmas..spring and summer stays the same. I just adore that hymnal covered board. Stunning! Your close up shot really shows off just how special it is. I have always wanted a boxwood wreath too, but I just haven't been able to part with the dough. I think it looks great, simple and elegant. Now, I want one even more!! I like your mantel and it does not look like Christmas to me. Perhaps you could work a fall colored ribbon in somewhere to appease the naysayers. I don't change my mantel with the seasons. After I sprung for a portrait of my children, I hung it over the mantel and I fear that if I move it that it may get damaged. I cover it for Christmas. For other holidays I sometimes work a few small objects around the edges but the portrait stays there all the time. Husband don't usually know enough about decorating to give a valid opinion, at least mine doesn't. I like the book pages. I have used them in a few of my own projects. I also have a boxwood wreath up all year. Maybe it is the red candles that are giving the Christmas vibe. You could always try green or cream candles. I just try to remember that decorating for me is a process and I am still learning. Being a stay at home Mom looking at the same walls many days in a row, I decorate to make me happy. My family likes what I do but it's not always as enthusiastic as I'd like. They're more excited about whats for supper. Anyways.... I said all that to say, your mantel is beautiful! I love your mantel. Hey this is my take on decor. Surround yourself with what you love and you will be happy. You live there and should have things around you that you love to make a home cozy for you. well....I think it's gorgeous.!! I think we tend to forget that not everyone is in the blogworld and the decorating trends. My husband just shakes his head at some of the stuff I drag home. :) I just received in the mail yesterday 3 preserved boxwoods wreaths, smaller than I thought they would be so now I have to figure out a new place to put them for Christmas. 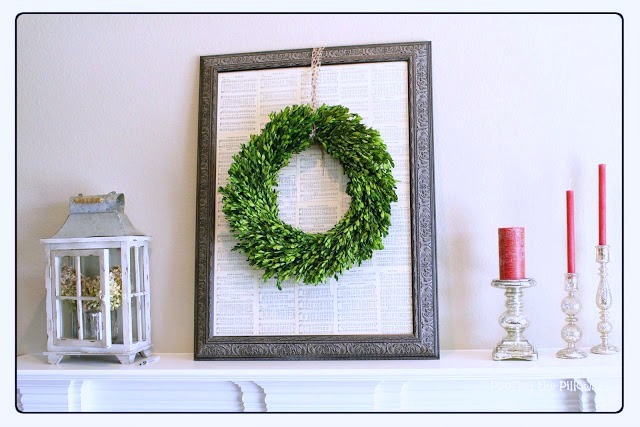 I love the boxwood wreath and the framed pages! I think it looks great! I wouldn't change a thing! Sadly, I don't have a mantle but if I did, I would have fun changing it up for the holidays! Have a great week! I love it, and I didn't think it was Christmas. xoxo I always have a few wreaths out. Love the wreath over the pages. Simple. Classy. I guess I can see the Christmas comments in a way - a wreath, some candles. Minimalist Christmas with orange candles? I don't know why people say or think the things they do. I really like your mantle! Your mantel turned out beautiful! I have yet to break down and buy a preserved boxwood in that size. They are so lovely. Thanx for visiting THT! I love the boxwood wreath and I have a few up in my house all year round. Go for it! Well, I love your mantel. I think the hymnal pages are genius and you didn't waste your money on that beautiful wreath...I can see it being used lots of times. Yes, Mercury glass is definitely out year round in my house. and yes, I do change my mantel with the seasons. Stacey, I think it's beautiful! I wouldn't worry about what others think, if it makes you happy that's what's important. Must agree with hubby that with just a few added things you can easily make it work for Christmas. Thanks for sharing with SYC. And yes, I do change it for every holiday and season. I figure it needs dusting, so why not mix it up. lol! 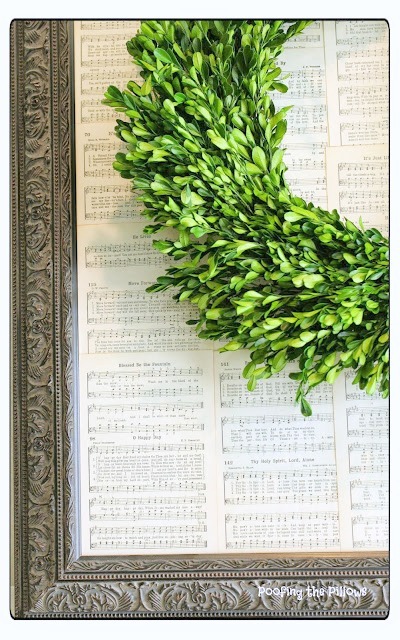 Your wreath is gorgeous and I love how you framed the hymns! Your mantel looks great! I like the hymnal pages in the frame. I wanted to cover a table top with them, but haven't got that far yet. I wonder if it might have been more effective to enlarge just one? --- more expensive, though. I tend to agree with your husband - it does look like Christmas! Red, white and green. Me, I'd toss a few fall-colored silk leaves around to bring the yellow/orange into the mix just a little. But as you said - it's YOUR mantle! And it IS very nice! I've experienced the same thing when friends come to visit. I may be really excited about something I've done in the house, but I'm left feeling deflated when I can see they don't like it. In the end, the only one I need to please is me, so I've learned to try to ignore the negativity. 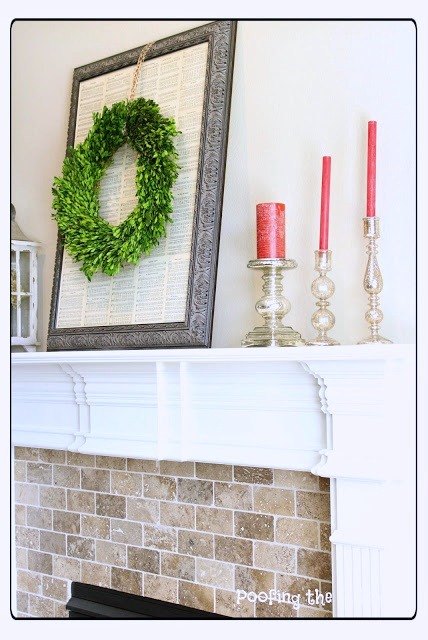 Your mantel looks so pretty with your boxwood wreath!! Maybe white candles would let the green wreath be the star of the show. I struggle with mantel decorating every season. Our living room mantel is shallow and tall- must have been the style in 1921, and our dining room faux fireplace is situated between two windows, so it's difficult to decorate, too. 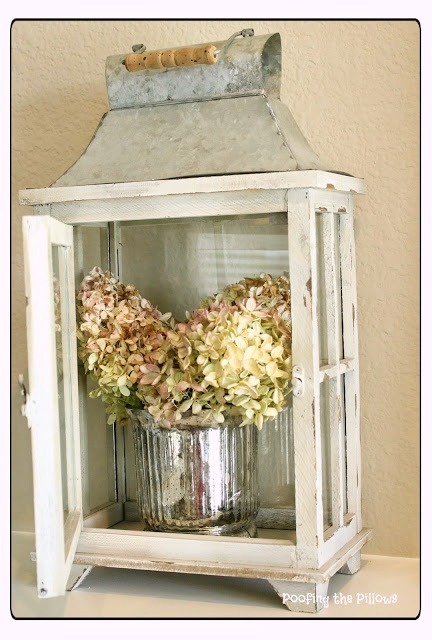 At least there's lots of inspiration in Blogland! I am reading backwards trying to catch up after a 4 day mini vacation. Well, I read your Monday post on Wednesday so my Wednesday is being used to finalize the details for our Thanksgiving table. I realized I didn't have matching flatware for the number of people so I found some cobalt blue flatware to match some yellow I already have. Our table will not be traditional Thanksgiving colors, but I don't often follow rules anyway. I love the pitcher you found and that red transferware. I didn't know you husband had sight issues so I will have to read more. I love the boxwood wreath and I think you should decorate anyway you like. I know people wonder about some of my choices.